Among my favorite meaty treats, chicken still tops my list. And despite the growing number of Korean-style chicken establishments popping in the Metro, I still haven't found myself tired of checking them out. In fact, my undying craving for the famous crispy glazed double-fried chicken has led me to another exciting destination, Clucky's. 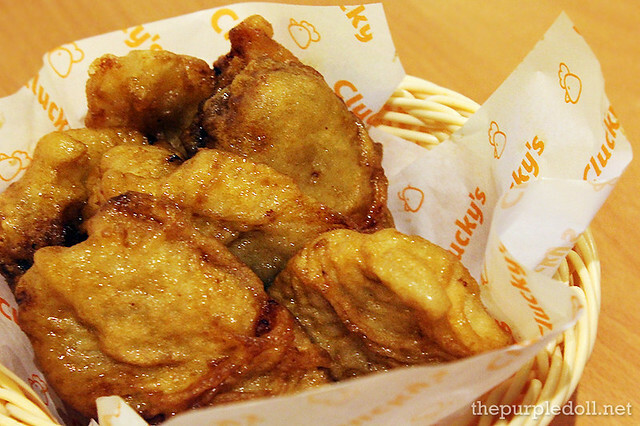 Tucked in Rockwell Business Center, Ortigas is a new Korean-style chicken destination by the name of Clucky's. Despite being a Philippine-born pay-as-you-order dining spot, this restaurant has partnered with New York's Mad for Chicken, one of the most famous Korean-style fried chicken brands in the USA, to bring us a taste of authentic Korean-style fried chicken sauce made from unique ingredients only found in Korea. With a promise of fast and efficient service, clean and modern space design, reasonable prices and great quality double-fried chicken, I found myself more than excited to try out the food at Clucky's which are available as a value meal, or a la carte. It was also nice of the establishment to include other items -- sidings, main dishes, and even dessert. 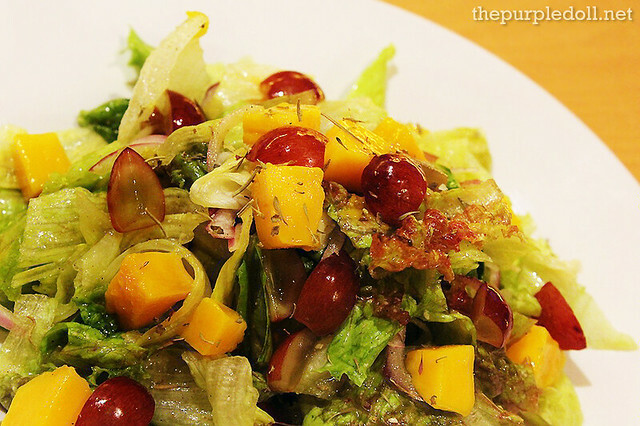 For a light start, we first had a serving of the House Salad (P119), a refreshing plateful of mixed greens, red onions, ripe mangoes and grapes in a sweet and tart vinaigrette dressing. If I remember it correctly, fruits in this ensemble vary depending on availability. Rest assured though that they only use the freshest ingredients to ensure great quality. 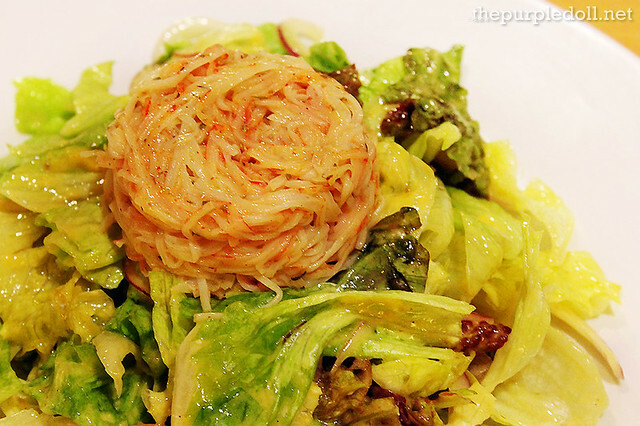 We then had a serving of the Spicy Crabmeat Salad (P159) made with mixed greens and spicy kani shreds. As a kani salad lover, I already expected to dig this very appetizing treat. Every forkful was full of spicy and savory crabmeat goodness, with a hint of sweet and tangy flavors. I also loved the fact that Clucky's doesn't scrimp on the kani shreds. As a potato lover, the supposed-to-be-sidings for the chicken easily became my pre-main course snack as I devoured this basket of Parmesan Fries (P79). 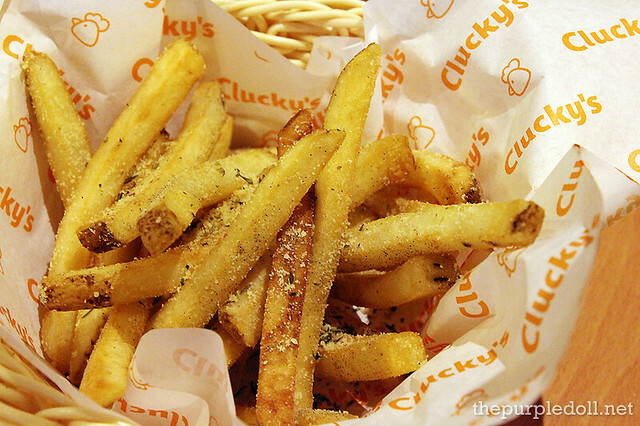 Unlike most french fries offered in other restaurants, Clucky's fries weren't greasy nor too salty. They're still good though as they're seasoned with herbs, spices and Parmesan cheese. This serving of Calamari (P119) was emptied even faster! With a crispy batter, a chewy squid goodness, and a garlic aioli dip, this was a sure-shot blockbuster. 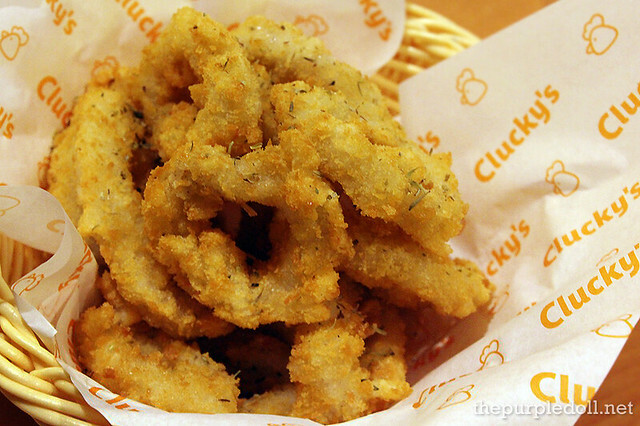 I can't even stop munching on them and even got some more from our companion's calamari basket. To start off our chicken fest, we first had the Soy Garlic Tenders (P199), six pieces of breast fillets coated with batter, deep-fried and glazed with Mad for Chicken's special soy garlic sauce. While I didn't find the coating crispy for my liking, I enjoyed the sweet, savory sauce and the soft, moist and tender chicken meat. Of course, expect that these lean cuts aren't as juicy and as succulent as the thighs and wings. We had two orders of Medium Combo: 8 Wings & 4 Drums (P449) in both soy garlic and spicy sauce. Between the two flavors, I prefer the sweet and savory soy garlic. However, I'm sure spicy food lovers will enjoy the spicy sauce as well. For both servings, I noticed that the wings were paler than the drumsticks. And while we were told that the drumsticks were marinated and the wings weren't, both still tasted great especially with Mad for Chicken's sauce. Note though that I didn't find them as crunchy as I'd hoped for, but they're still very good treats to munch on their own or to pair with some rice. 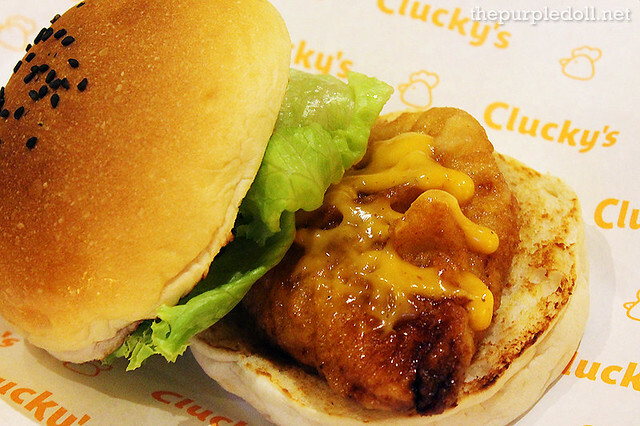 Aside from the wings and drums, we also sampled the Chicken Burger (P65) made from chicken tenders, cheese sauce and lettuce sandwiched in a soft bun. Although I wasn't craving for burgers that night, I found myself enjoying every bite from this treat. 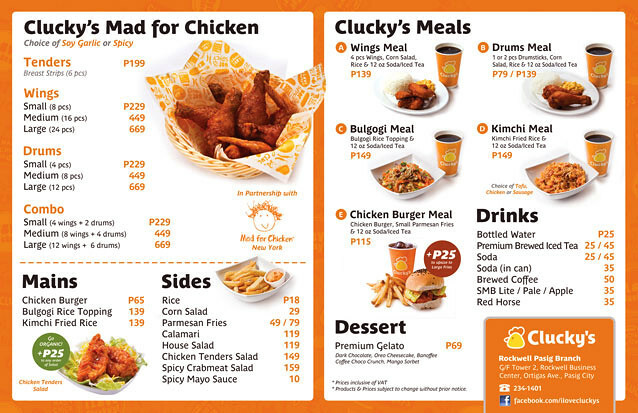 Clucky's also offers the Bulgogi Rice Topping (P139) to complete the Korean-style dining experience. 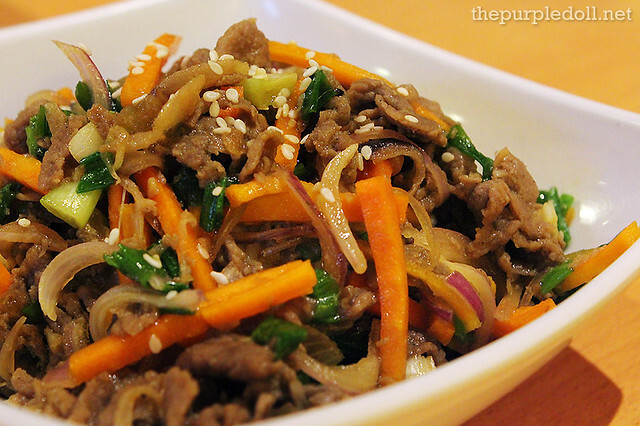 This ensemble is made up of rice topped with bulgogi, onions, carrots, leeks and sesame seeds. While I love how the beef pieces were so tender and succulent, I found this bowl a little lacking in terms of overall flavor. Maybe some bulgogi sauce mixed with both the rice and the toppings can pimp this dish up. We also got to try the Kimchi Fried Rice (P139), a rice dish rich in sweet, spicy, savory and tangy flavors of kimchi. While I'm generally not too fond of kimchi, I can say with full conviction that I love this Korean fried rice. Every spoonful is an explosion of sumptuous kimchi goodness. And even without any viand, I'd gladly take on an order or two! 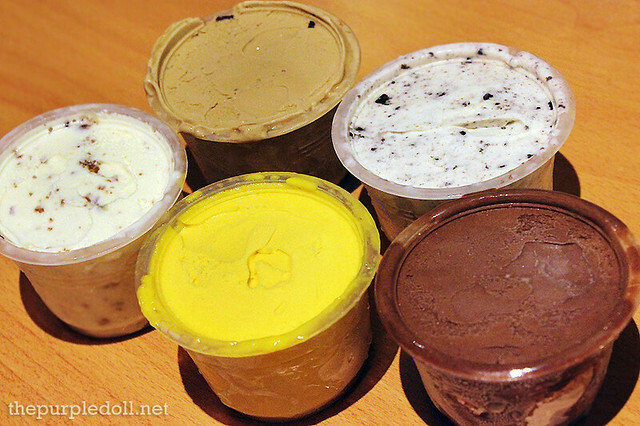 To cap off our dinner, we had some Premium Gelatos (P69 Each) in Coffee Choco Crunch, Oreo Cheesecake, Banoffee, Mango Sorbet, and Dark Chocolate. While each of these delectable flavors is a lovely treat, I specifically dig the Banoffee -- a subtle and refreshing blend of banana and toffee, and Dark Chocolate -- a deep and rich semi-sweet chocolate flavor perfect for dark chocolate lovers like me. If only my throat wasn't hurting that night, I swear I would've hoarded these two flavors for myself. 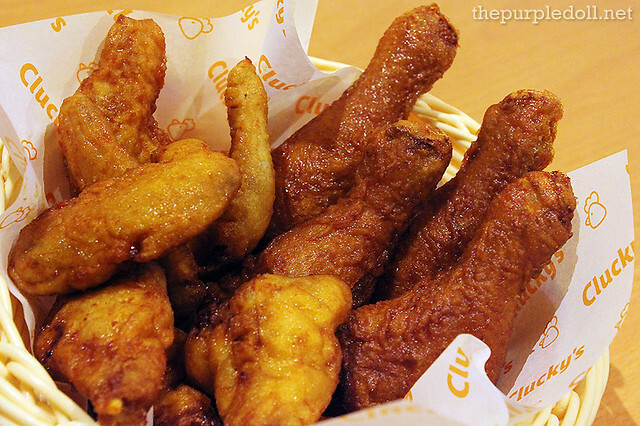 Although there are a lot of Korean-style fried chicken establishments around, I can say that Clucky's is definitely worth a trip. Every item we got to try was of great quality as each dish was freshly cooked upon ordering. Prices are also very reasonable as the dishes aren't only generous portion-wise, but also taste-wise. And with my new-found favorite items like the Spicy Crabmeat Salad, Kimchi Fried Rice and Premium Gelatos on top of the Soy Garlic Chicken, I'm very sure to pay Clucky's another visit soon. I think they do offer delivery! :D Give them a call soon, love their chicken, kimchi fried rice and spicy crabmeat salad! OMG! Those dishes are mouth watering. I have to try that chicken. I might try thi out once I passed Rockwell looks delish! Looks yum, yumm, yuummm!! I'd like to try their fries, too. Parang ang sarap nun coating. 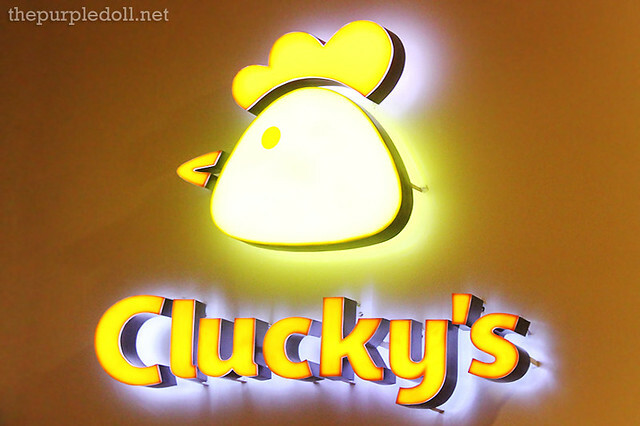 I think Clucky will be opening at SM North Annex soon! Thanks for the review, Sumi! Now I know what will I order. I'm thinking of the Calamari, Kimchi fried rice and of course their chicken! I want to try the Kimchi fried rice,looks so YUMMY!! Wow chicken. thats my favorite since i was a kid!! sarap ng chicken favorite namin lahat sa bahay yan! Everyone's favorite Fried Chicken, your post always makes me wish that I have all the money to try out all the restaurants out there that you've blogged, and this will be on my list. Thanks for this post will surely visit CLUCKY's. The images are delicious. Not only very good cooking skills but also good camera.